To avail certain sites/services on amarujala.com ("amarujala.com" or "Site"), users are required to provide certain information for the registration process namely:- i) Your Name, ii) e-mail address, iii) Gender, iv) Age, v) PIN code, vi) Password and/or your occupation, interests, etc. When you register using other third-party services like Facebook, Google, Twitter, Instagram, etc, we retrieve information from such accounts in order to continue providing you our services. The Information as supplied by the users enables us to improve our sites and provide you the most user-friendly experience. In amarujala.com in Contests sometimes we require your contact addresses. All required information is service dependent and Amar Ujala Publications Ltd may use the above said User information to, maintain, protect, and improve its services (including advertising services) and for developing new services. The Cookies Policy of Amarujala.com permits the users to delete the cookies from the Cookies Policy page. 3. What are the different third party cookies we use in our website? OneSignal amarujala.com uses the OneSignal platform to provide its users with the functionality of web push notification over the app and site. The OneSignal cookie and tools provide amarujala.com with not only the push notification feature but also the analytics about the response of the users on the notification. When it is requested or required by law or by any court or governmental agency or authority to disclose, for the purpose of verification of identity, or for the prevention, detection, investigation including cyber incidents, or for prosecution and punishment of offenses. These disclosures are made in good faith and belief that such disclosure is reasonably necessary for enforcing these Terms; for complying with the applicable laws and regulations. In addition, we may transfer personally identifiable information, if we or one of our business units are acquired by, sold to or merged with another company. The Company may share your information regarding your activities on websites or Applications with third-party applications, social websites and/or with our advertisers to help them understand our users and confirm the value of advertising on our websites. Amarujala.com may collect and store the personal information like location, cookies, Birth Details, etc., including contact details of its users in order to operate the site in an efficient and effective manner and provide users with information on astrology services & products that may be of interest to them. In addition, this information allows us to provide users with relevant astrological details. We also automatically track certain information based upon your behavior on the site and use this information to do internal research on our users' demographics, interests, and behavior to better understand, protect and serve users in general. It is clarified to our users that we do not sell or share personal information of our users to any third party except affiliate / associate companies of Amarujala Web Services Ltd. for any reason if the user has indicated a desire to keep the information private. When you use Amar Ujala Publications Ltd's websites, we make good faith efforts to provide you, as and when requested by you, with access to your personal information and shall further ensure that any personal information or sensitive personal data or information found to be inaccurate or deficient shall be corrected or amended as feasible, subject to any requirement for such personal information or sensitive personal data or information to be retained by law or for legitimate business purposes. We ask individual users to identify themselves and the information requested to be accessed, corrected or removed before processing such requests, and we may decline to process requests that are unreasonably repetitive or systematic, require disproportionate technical effort, jeopardize the privacy of others, or would be extremely impractical (for instance, requests concerning information residing on backup tapes), or for which access is not otherwise required. In any case, where we provide information access and correction, we perform this service free of charge, except if doing so would require a disproportionate effort. Because of the way we maintain certain services after you delete your information, residual copies may take a period of time before they are deleted from our active servers and may remain in our backup systems. All information gathered on Amar Ujala Publications Ltd is securely stored within the Amar Ujala Publications Ltd controlled database. The database is stored on servers secured behind a firewall; access to the servers is password-protected and is strictly limited. However, as effective as our security measures are, no security system is impenetrable. We cannot guarantee the security of our database, nor can we guarantee that information you supply will not be intercepted while being transmitted to us over the Internet. And, of course, any information you include in a posting to the discussion areas is available to anyone with Internet access. By entering the entrant represents, acknowledges, and warrants that the submitted content is an original work created solely by the entrant, that the Contestant does not infringe on the copyrights, trademarks, moral rights, rights of privacy/publicity or intellectual property rights of any person or entity, and that no other party has any right, title, claim, or interest in the photograph. The content provided by Contestant must not, in the sole and unfettered discretion of the Sponsor, contain obscene, provocative, defamatory, sexually explicit, or otherwise objectionable or inappropriate content. Entrants agree that this Contest shall be subject to and governed by the laws of the Government of India and the forum for any dispute shall be subject to the jurisdiction of the courts of New Delhi. By entering, entrants also agree (a) to be bound by these Official Rules; (b) that the decisions of the Judges are final and binding with respect to all matters relating to the Contest; and (c) if the entrant wins that Sponsor may use the content of winners and each winner's name, content, likeness, and/or voice in any publicity or advertising relating to the Contest or future promotions without compensation or approval (except where prohibited by law). All federal, state/provincial/territorial, and local taxes, fees, and surcharges and taxes (whether foreign or domestic, and including income, sales, and import taxes) on prizes are the sole responsibility of the prize winners. In the event that the selected winner(s) of any prize is/are ineligible, cannot be traced or does/do not respond within ten (10) days to a winner notification or refuses the prize, the prize will be forfeited and Sponsor, in its sole discretion, may choose whether to award the prize to another entrant. 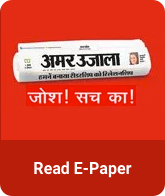 Amar Ujala can resell, re-purpose credits of usage of the content provided by entrant in print or online. If for any reason the Contest is not capable of running as planned, due to infection by computer virus, bugs, worms, trojan horses, denial of service attacks, tampering, unauthorized intervention, fraud, technical failures, or any other causes beyond the control of Amar Ujala Publications Limited that corrupt or affect the administration, security, fairness, integrity, or proper conduct of this Contest, Amar Ujala Publications Limited reserves the right, at its sole discretion, to disqualify any individual(s) who tamper with the entry process, and/or to cancel, terminate, modify, or suspend the Contest. If Sponsor elects to cancel or terminate the Contest, Sponsor will not retain any rights in the submitted contents. Entrants agree that personal data, especially name, and address, may be processed, shared, and otherwise used for the purposes and within the context of the Contest and any other purposes outlined in these Official Rules. The data may also be used by the Sponsor in order to verify the participant's identity, mail address, and other information or to otherwise verify the participant's eligibility to participate in the Contest. For any queries and concerns related to your personal information and privacy, you can contact our Data Protection Officer at [email protected] Alternatively, you can directly write to The Data Protection Officer, Amar Ujala Web Services Private Limited, C-21, 22, Sector - 59, Noida ( UP), 201301, INDIA. Registered users can manage, export or delete their personal data from their profile.